The Pathway is an original composition and one of the tracks from Nana's new CD "Skins". The lyrics were inspired by the sufi woman poet Mahsati Ganjavi who lived in Azerbaijan in the early 12th century. Nana Simopoulos, the internationally acclaimed multi-instrumentalist, singer, composer and educator, is set to release Skins, her seventh recording, on June 20, 2016. Skins features eight Simopoulos originals, brilliantly performed by a band of world-class jazz musicians and first-class world musicians, including saxophonist Dave Liebman and sarangi maestro Ustad Sultan Khan. The beautifully recorded album draws from sources and influences spanning centuries and the globe, with the composer referencing various cultures and her own past. The CD title, Skins, is taken from a piece Simopoulos wrote for a performance in which a dancer used projections of different skins on her body, creating virtual costumes. The title could apply to Simopoulos herself—the artist is a musical shape shifter who has explored diverse forms of expression with sound, including musical theater, film scores, and dance scores for a range of styles including ballet and tap, as well as accompaniment for spoken word and poetry. She is deeply immersed in the music of India, Greece, South America, Africa, and Asia. Simopoulos is known for putting her own distinctive stamp on each performance and composition. 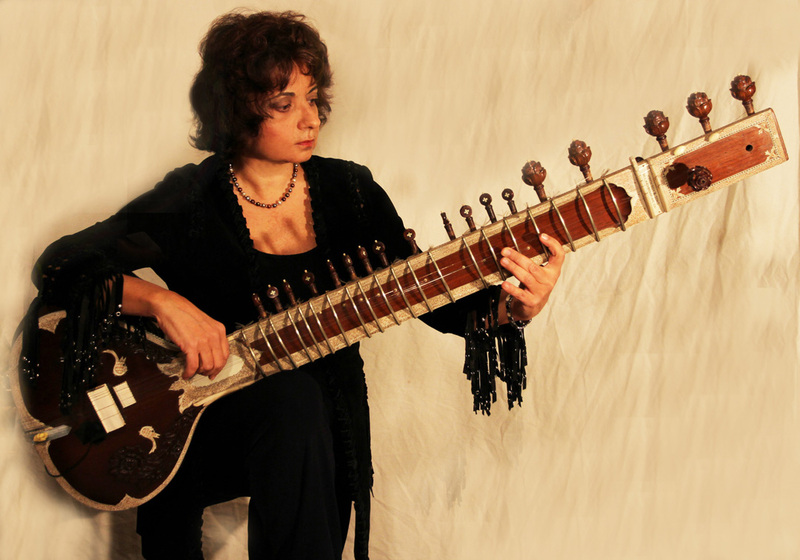 The accomplished and versatile Simopoulos studied piano as a child and went on to study guitar with Ralph Towner, Joe Diorio, and Pat Martino; she also has performed and recorded on sitar, bouzouki, didgeridoo, kora, synthesizer and other instruments. She is intrigued by the sonic potential offered by found objects such as tools and construction materials, and has written site-specific pieces utilizing them. Simopoulos has played with jazz legends including Don Cherry, Charlie Haden, and Billy Higgins; world music icon Nana Vasconcelos; and appeared with the New York City Opera and RAI Symphony Orchestra. She’s performed in venues from the intimate Café Sabarsky to the imposing Cathedral of Saint John the Divine to the open-air Montreux Jazz Festival. Besides Simopoulos’ unique musical tone of voice and point of view, Skins proudly flaunts jazz, New Age and world music influences, drawing from lyrical inspiration from sources as diverse as the Persian Sufi poet Rumi and a Native American shaman known as Owl Woman. There’s a sensual and spiritual feel in the lyrics and delivery throughout that can be interpreted – and enjoyed! – on many levels. “For No Reason,” a straight-ahead cooker with a dynamic guitar line brilliantly played by Simopoulos, along with her flowing vocal of lyrics inspired by writings of the Sufi poet Hafiz. “Inside” and “Let Fire Burn Me” are both Eastern-flavored pieces inspired by Rumi. “Inside” features a gorgeous, introspective wood flute and saxophone solo from Dave Liebman, a veteran musician at the peak of his powers. “Let Fire Burn Me” shines with layered vocals, a supple, gliding rhythm and subtle drive. The words of the haunting and understated “Merely to Know” are based on a poem by Kojiju, a 12th century Japanese Buddhist nun; Simopoulos wrote the lyrics recently and paired them with the melody of “Till We Meet Again,” a composition of hers originally recorded in the 1980s. “The Pathway” was fueled by the writings of a 12th century female Sufi poet; Simopoulos set the words to “Elements,” another of her tunes from an earlier recording. With a lilting melody and insightful lyrics, the road to enlightenment has rarely sounded so appealing! Saxophonist Dave Liebman, who has has worked with jazz icons such as Miles Davis, Elvin Jones, Chick Corea, and McCoy Tyner. Run the numbers on him and you’re sure to be impressed: In his half century as a professional musician and educator, the NEA Jazz Master has appeared on more than 500 recordings with some 200 as a leader; he’s written hundreds of tunes, and earned dozens of awards. The late Ustad Sultan Khan was a master of the sarangi, a bowed multi-stringed instrument, which he performed alongside Ravi Shankar, George Harrison, Zakir Hussain, and on numerous movie soundtracks for films made in his native India and other countries around the globe. Bassist Mary Ann McSweeney cites the legendary Ray Brown as an inspiration. At age 16, McSweeney played the Monterey Jazz Festival with the Thad Jones/Mel Lewis big band. She’s an alumna of bands led by Dizzy Gillespie, Joanne Brackeen and Lee Konitz, and has worked with conductors including Leonard Bernstein, Lalo Schifrin, and John Williams. Royal Hartigan is a renowned drummer, percussionist, pianist, tap dancer, and educator. He studied with iconic jazz drummer Ed Blackwell, and is a Fulbright award winner, the author of “Blood Drum Spirit,” a massive analysis of world drumming traditions, and a professor at the University of Massachusetts/Dartmouth. Bassist Manos Loutas, drummer Michalis Orphanidis, percussionists Jamie Haddad, Solis Barki and Greg Beyer; saxophonists Charlie Tokarz and Dimitri Vassilakis and singers Caryn Heilman, Markos Simopoulos and Davi also offer strong contributions. Skins has been a long time in the making—this is Simopoulos first new release since 2001—but the fine results justify the wait.